Fellowship Previews: YOUNGBLOOD is Back! Image Comics is pleased to announce the return of Rob Liefeld’s YOUNGBLOOD—the blockbuster hit series that launched the Image Revolution and turned the comics industry on its head—with story by Chad Bowers (X-Men ‘92, Deadpool: Bad Blood) and art from Jim Towe. YOUNGBLOOD is reborn with an all-new cast and a bold new mission with YOUNGBLOOD #1 issue—set to hit stores this May. "Youngblood has had outstanding talent contribute to its amazing history,” said Liefeld. “Alan Moore, Robert Kirkman, Keith Giffen and Mark Millar are a few who have left their mark. Chad Bowers and Jim Towe are four issues into their run and are producing stories that will be held as some of, if not the best Youngblood tales ever told. It honors the best of the past and forges exciting new paths for these characters!" In this YOUNGBLOOD #1, an uber popular self-protection app called HELP! is changing how we stay safe—“HELP! lets you decide who saves you.” But when a high-rated young hero on the app goes missing, his best friend’s search for answers gains the attention of some unexpected allies, and together, they’ll do whatever it takes to find him… even if it means resurrecting the world’s most hated super-team, Youngblood. "Trust me, you've never read a Youngblood story like this,” said Bowers. “I'm so incredibly proud of what Jim and I are doing on this book, and can't wait for readers, especially those who've maybe never picked up a Youngblood comic, to see what all the fuss is about!" The series will also feature jaw-dropping alternate covers by Rob Liefeld, David Finch, and Chris Daughtry—so, gear up, strap in, and get ready to rediscover comics most Extreme universe. 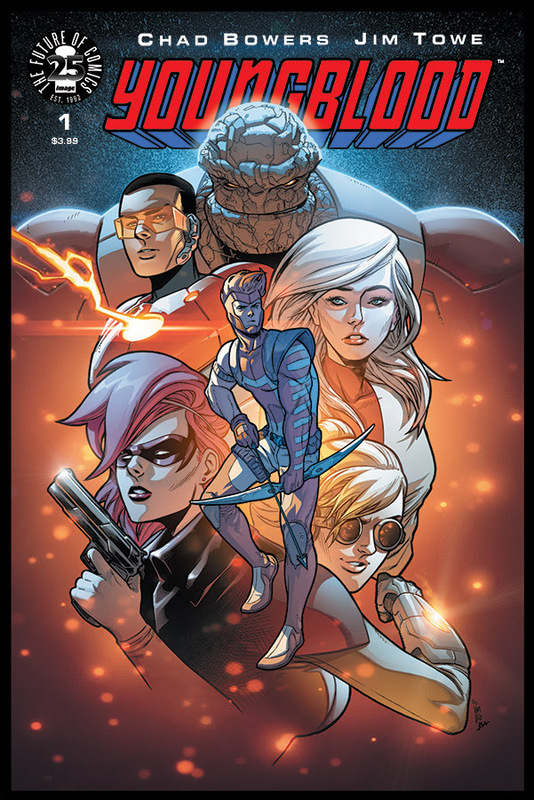 YOUNGBLOOD #1 Cover A by Towe (Diamond Code MAR170637), Cover B by Liefeld (Diamond Code MAR170638), Cover C by Finch (Diamond Code MAR170639), and Cover D by Daughtry (Diamond Code MAR170640) hit stores on Wednesday, May 3rd. The final order cutoff deadline for comics retailers is Monday, April 10th.